With the new CVT delivering much better gas mileage, the base six-speed manual gearbox is less attractive than before, but a base 2014 Subaru Outback 2.5i with few other options than the CVT offers great value for the money. Above all else, the 2014 Subaru Outback remains an eminently practical and capable vehicle, with generous interior space both for people and their gear. The 2014 Subaru Outback is a poster child for the Japanese carmaker. It's a capable, sturdy, pragmatic family wagon that is more carlike than SUV-inflected. More than just a Legacy wagon, the Outback's added ground clearance doesn't interfere with its on-road goodness, it just amplifies its all-weather appeal. Although the 2014 Outback is still a strong entry in the market, there's a new-generation 2015 Subaru Outback on the way, with some important infotainment upgrades and what promises to be a more refined driving experience. As it stands for 2014, the Outback is still nowhere as luxurious at the high end as comparable models of the Jeep Grand Cherokee, Ford Edge, Toyota Venza, or Volvo XC60. But it's also far less expensive than most of those vehicles, and it continues to be what it was 20 years ago: a reliable, safe, and very capable all-wheel-drive vehicle for adventurous souls who don't need bells, whistles, or victory in the stoplight drag races. Outback buyers, whether they keep their cars for four years or 14, could often afford much fancier vehicles--but they remain remarkably loyal to the Outback's traditional virtues. Low-mileage used Outbacks are almost impossible to find, and more than 90 percent of Subarus sold in the last 10 years remain on the road. The 2014 Outback has a slab-sided and chunky look, with exaggerated wheel arches and tall SUV proportions. It got a new grille and headlamps last year, but that was a very minor tweak, and it looks all but identical to the 2010 model. New upholstery fabrics and available woodgrain on the dash are the only interior updates of note. Last year, the Outback got a new 2.5-liter flat-four engine that returns higher gas-mileage ratings, especially when paired with the CVT. Its 173 horsepower gives it marginally better performance than earlier engines, and the torque is spread across a broader range of engine speeds, making the latest Outback more responsive. Unusually for a mid-size utility vehicle, you can order the four with a six-speed manual gearbox, but that's only available on base models. Most buyers opt for the CVT, which includes paddle shifters behind the wheel to simulate "gear shifting" for better performance. Subaru has produced one of the better CVTs on the market, tuning it to be responsive and unobtrusive under full-throttle acceleration without making the engine rev up to its maximum and stay there. The most fuel-efficient Outback model this year is rated at 26 mpg combined--and remember it has all-wheel drive as standard. The high-end engine, available only on 3.6R models with Limited trim, is a 256-hp 3.6-liter flat-six paired with a five-speed automatic transmission. The combination is smooth, quiet, and considerably faster than the four, but at the cost of much worse gas mileage--only 20 mpg combined. Many people think of all-wheel-drive cars as tall and tippy, but while the Subaru looks tall, its center of gravity is low in the chassis, and it's a relatively light vehicle for its size. That makes its handling far more car-like than most crossovers, and it can be hustled predictably through turns in a surprisingly sporty manner--especially the four, which is lighter and better balanced than the nose-heavy six. Updates last year to the suspension made it more comfortable on the road while reducing body roll in turns. The steering is good, but not exceptional, and all-weather tires trade off sports-car stickiness for ease over rocks and ruts once you leave the asphalt. And it's off road that the Outback's 8.7 inches of ground clearance make it uniquely suited to a huge variety of terrain, from paved highways to rutted mountain trails. You wouldn't take an Outback rock-climbing next to Jeeps, but it'll do almost anything else--and along with the huge variety of roof carriers, ski and surfboard racks, and more, that's what makes it a favorite of buyers who favor active sports like kayaking, rock-climbing, hiking, and snowboarding. This iteration of the Outback has a great deal of interior space for five adults. The rear seats are particularly spacious, with excellent head and leg room, and the seat back reclines as well as folding down to expand the cargo space from 34 to a voluminous 71 cubic feet. No third-row seat is offered. Safety features start with standard all-wheel drive, and a new Brake Override system added last year that cuts engine power if both the brake and accelerator are pressed simultaneously. Another new feature last year was the optional EyeSight driver-assistance, which bundles adaptive cruise control, lane-departure warning, and pre-collision braking. Each of those capabilities uses data provided by a front-facing stereo camera system. The four-cylinder 2014 Subaru Outback 2.5i model comes in three trim levels, but the six-cylinder 3.6R is offered only with the top-of-the-line Limited trim. All Outbacks come standard with audio and cruise control switches on the steering wheel, automatic headlights, a Hill Holder feature that prevents the car from rolling when stopped on a sloping road, and a reclining rear seat with a seatback split 60/40. The base trim level includes an AM/FM/CD audio system with four speakers, including an auxiliary input jack for digital music. Bluetooth pairing, a USB charging port, audio streaming, and iPod control are also standard even on the base stereo. The mid-level Premium trim, the most popular among Outback buyers, adds 17-inch alloy wheels, a 10-way power driver's seat, leather covering on the shift knob and steering wheel, and an All-Weather Package that bundles heated mirrors and front seats with de-icing windshield wipers. That package, popular in snowy climates, is optional on the base Outback. The high-end Outback 2.5i Limited adds still more features, including dual-zone climate control (with rear air-conditioning outlets), perforated leather upholstery, a four-way power adjustable passenger seat, and a nine-speaker Harman/Kardon stereo premium 440-Watt audio package with its own color 4.3-inch display, a 440-Watt amplifier, and standard satellite radio (with four months free). Limited models also include electroluminescent instruments that's integrated with a 3.5-inch display screen that shows EyeSight functions (if that feature is fitted) plus an Appearance Package that bundles keyless start with a two-position memory function for the power driver's seat. Options include a GPS navigation system wtih a 7-inch LCD screen and voice control, plus real-time satellite traffic data. Finally, a Power Moonroof Package includes not only the moonroof itself but an auto-dimming rear-view mirror and a rear-vision camera to assist reversing (which can also be ordered separately). The 2014 Subaru Outback mixes utility vehicle and station wagon lines, meaning it looks like a Subaru. Since its 2010 redesign, the Subaru Outback has sported bigger roof pillars, wider rear quarter and side windows, and larger front and rear wheel arches. The 2014 edition can look a bit forced, but such "SUV details" make the Outback more attractive to crossover buyers, Subaru says, who won't even consider something they consider to be just a wagon. Last year, the grille and front end were redesigned to be slightly chunkier and polygonal; a heftier grille is set off by larger fog lights and a bigger opening under the bumper. The differences remain subtle, though, and most likely only Outback aficionados will be able to tell the latest models from those three or four years old. Until this redesign, a conventional wagon version of the Legacy sedan was offered--as well as the jacked-up, tougher-looking Outback. 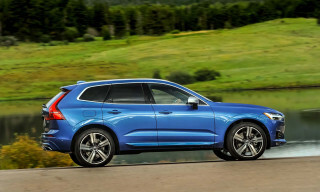 That Legacy wagon is no longer offered in the U.S. market, though, and the Outback's "SUV details" can make it look slightly like a steroidal cartoon of itself. There's no exaggeration inside, though. A single instrument cluster faces the driver, with the center part of the dash sweeping down to join the console on the tunnel. Simple, large controls are generally self-evident, and the interior overall is restrained. It's simple and functional, and won't look dated like trendier designs. It's the kind of view from behind the wheel you could imagine living with for a number of years. The 2014 Subaru Outback offers two engines--a four for fuel economy, a six for power--but the AWD matters most. The 2014 Subaru Outback won't win many stoplight drag races in its four-cylinder form, but that's not how most owners define "performance" for the capable, durable crossover utility vehicle. Instead, they prize its ability to cope with a wide variety of road surfaces--from paved highways to rutted, muddy mountain tracks strewn with stones--and its reputation for longevity. The Outback's acceleration is competitive, and its roadholding and handling are surprisingly good for this large a car, but that's not really what owners look for. The 2.5-liter flat-four base engine was new last year, and it's an all-new design for Subaru--which only launches a new engine every 20 years or so. 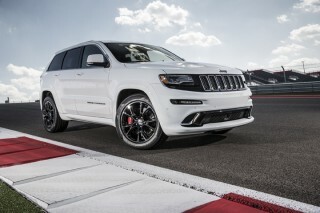 It's rated at 173 horsepower and 170 lb-ft of torque, marginally better than its similarly-sized predecessor. But the torque comes over a much wider range of engine speeds, and the new engine has been designed for a notable boost in fuel efficiency. Most buyers will opt for Subaru's Lineartronic continuously variable transmission (CVT), but a six-speed manual gearbox is also available on low-end models--a rarity for any mid-size wagon or utility vehicle. Responsive under hard acceleration and unobtrusive during normal operation, the Subaru CVT is one of the best offered on any car today. It boosts gas-mileage ratings substantially over earlier Outback powertrains, but its biggest benefit is that it's simply not as annoying as CVTs from some other makers. It comes standard with paddle shifters that let the driver "shift" up and down through six simulated fixed "gear" ratios, just like a multi-speed automatic. Otherwise, even on full-throttle takeoffs, while it will rev the engine to its most powerful speed--around 5500 rpm--it manages to apply enough power while doing so that drivers don't get the "all-noise-no-acceleration" sensation of lesser CVTs. Subaru has kept the engine noise from being obtrusive and loud, and we'd point other makers to Subaru for lessons on how to make CVTs palatable. Level highway cruising is accomplished with engine speeds as low as 2000 rpm. The result is EPA ratings for the four-cylinder/CVT combination of 26 mpg combined (24 mpg city, 30 mpg highway). If you opt for the rarer six-speed manual gearbox, the combined rating falls to 24 mpg (21 mpg city, 28 mpg highway). The only other powertrain option for the 2014 Outback is the long-unchanged 3.6R model, with a 256-hp flat-six engine displacing 3.6 liters. It's offered only with a five-speed automatic transmission, and it's quiet, smooth, and powerful. If you really do care about stoplight drag races, this is the engine to pick--but you'll pay the price in low fuel efficiency. The EPA rates this combination at just 20 mpg combined (18 mpg city, 25 mpg highway), which is lower than most competing mid-size utilities with optional or standard six-cylinder engines. Despite its high ground clearance and tall stature, the Outback has always handled more like a car than a crossover, due to the low center of gravity provided by its boxer engines and its light weight. On-road behavior was improved last year by a retuned suspension and some structural stiffening added to the body, which managed to reduce body roll at the same time it made the ride smoother and the cornering slightly more agile. One of the few competing vehicles that matches the Outback for nimble handling is the new 2013 Ford Escape--a compact crossover that's admittedly one car class smaller than the mid-size Outback. The feel of the Outback's steering is only average, but the roadholding compensates for that--and Subaru has fitted sturdy all-weather tires to handle a wide range of road surfaces and climates, so they're not optimized for maximum grip. With 8.7 inches of ground clearance--more even than competitors like the macho Jeep Grand Cherokee--the Subaru is almost unparalleled in off-road agility. It won't necessarily cross the Rubicon Trail like a trail-rated Jeep Wrangler, but it's far more capable than many all-wheel-drive crossovers targeted at suburban families whose idea of off-roading doesn't stretch much beyond gravel roads or muddy lacrosse fields. The Outback is both practical and deft on a huge variety of terrain, from deep snow to rutted, muddy mountain trails. The combination of ground clearance, long suspension travel, a stiff body structure, and electronically controlled all-wheel drive will power the car steadily up slippery hills and through muddy forests that may leave other, more glamorous crossovers stuck at the side of the road. While it'll never match a V-8 pickup on acceleration, under some circumstances, the Outback will even keep pace with all-wheel-drive pickup trucks. The 2014 Subaru Outback has oodles of interior space for passengers and cargo, like a wagon of old with way more capability. The 2014 Subaru Outback provides one of the most spacious rear compartments of any mid-size crossover, and the front matches the competition as well. Both headroom and legroom in both rows is adequate even for tall adults, and the reclining rear seat adds flexibility as well. There's no third-row option, but the tradeoff is a large 34-cubic-foot cargo bay that turns cavernous (expanding to 71 cubic feet) when the 60/40 split rear seatback is folded down. The Outback will comfortably hold five adults, and even with the front seats pushed back on their tracks, there's enough legroom for six-footers in the rear seat. It's easy to get in and out, too, through tall and wide rear doors that open wide. The legroom comes from a longer wheelbase than previous Outback models (though overall length stayed the same) and a taller roofline, boosting headroom. The front seats are well shaped and offer good support on long trips, though the tallest drivers may find the bottom seat cushion a little shorter than they'd like. Inside the car, plenty of trays, bins, and cubbies provide storage space for all the mobile phones, sunglasses, papers, soda cans, and loose change that accompany any road trip these days. Almost every Subaru seems to be fitted with the optional sturdy rubber all-weather floor mats for muddy hiking boots and wet gear--and Subaru prices them reasonably as a result. The company has also put a lot of thought into roof storage. The rail system has crossbars that pivot back and lie flat along the rails when not in use, to reduce aerodynamic drag, and there's an enormous variety of third-party accessories--ski holders, kayak mounts, storage boxes, bike racks, and more. Last year, Subaru improved the standard seat fabric, ditching the previous brocade-curtain fabric and making the seats more comfortable. There's also an optional "light matte wood grain" trim to give the interior a bit more sophistication on high-end models. Still, the interior is practical, durable, and utilitarian rather than glamorous and high-design--which Subaru owners value. High-contact points like the center console and the lower door panels have hard plastic surfaces that can scuff, but assembly quality is first-rate, with no rattles or squeaks. If it matters, every Subaru Outback sold in the U.S. is assembled in Indiana. The Outback still suffers from Subaru's Achilles Heel--wind noise around the large, usable door mirrors--but engine noise is sufficiently muted under most circumstances. 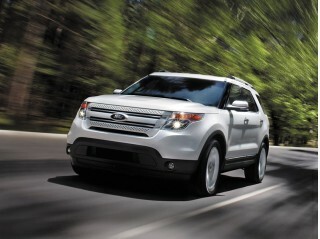 Overall, the refinement is acceptable if not the most hushed and soothing vehicle on the market. You'll know when the engine is at full power, and the Outback is hardly as quiet as a church or meditation center, but you won't find it tiring to travel in. The 2014 Subaru Outback is again one of the safest family vehicles you can get, with top ratings from both agencies. The 2014 Subaru Outback's main safety feature, airbags aside, may be its standard all-wheel-drive, a feature offered on no other affordable mid-size crossover. It includes stability and traction control systems, anti-lock brakes, and a hill-holder feature that keeps the car in place on slopes of 5 percent or more. For crash safety, there are six airbags, as well as seatbelt pre-tensioners. And last year, Subaru added a stereo camera system called EyeSight, centered around windshield-mounted stereo cameras, which detect potential obstacles on the road ahead. The data is fed to a bundle of different electronic safety systems, including adaptive cruise control, vehicle lane-departure warning, and pre-collision braking. The Insurance Institute for Highway Safety (IIHS) tested the Outback in its new and tougher small-overlap front crash category, and it earned an 'acceptable' score--still qualifying it as a Top Safety Pick+. And the National Highway Traffic Safety Administration (NHTSA) gives the 2014 Outback five stars (its highest rating) overall, and five stars in the frontal crash and side crash tests. It gets four of five stars for Rollover safety. On safety, perhaps our only substantial complaint about the current Outback is that its blocky styling impedes rear three-quarter and rearward vision, although Subaru offers a backup camera as a standalone option or as part of the optional navigation system. All-wheel drive is standard on the 2014 Subaru Outback, but it's a little sparse on high-end luxury features. 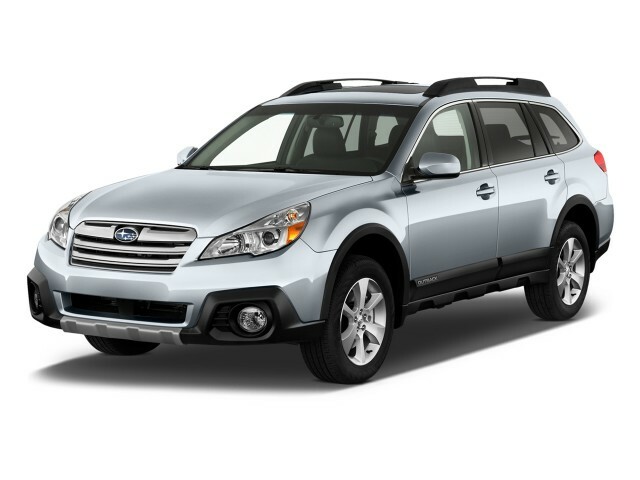 The 2014 Subaru Outback covers the basics well, offering standard all-wheel-drive and capabilities that make up for a lack of some of the high-end electronic features and luxury options offered by certain competitors. The base price is around $24,000, and even top trim levels rarely exceed $32,000, so the Outback represents good value for money on the practical, sensible, durable end of the scale. Every Outback comes standard with tilting and telescoping steering; air conditioning; cruise control; power windows, locks, and mirrors; an AM/FM/CD player with an auxiliary jack, Bluetooth and audio streaming, and iPod connectivity; steering-wheel audio and cruise controls; automatic headlights; and a 60/40 split-folding rear seat. The mid-level Premium trim adds to that a 10-way power driver seat; 17-inch wheels; leather trim for the shifter and steering wheel; and body-color side mirrors. It also adds as standard a previously optional All-Weather Package with seat and mirror heaters, along with a de-icer for the windshield wipers. That package, popular in colder climates, remains an available option on base models. Premium models do offer the option of an excellent 440-Watt Harman/Kardon audio system with nine speakers, and a 4.3-inch display, as well as SiriusXM satellite radio and four months of free service. The very top-of-the-line Limited models add a four-way power adjustable passenger seat; dual-zone climate control (with new rear air-conditioning outlets this year); and perforated leather upholstery. There's also an electroluminescent instrument cluster integrated with the 3.5-inch multi-information display screen that shows EyeSight functions if that driver-assistance feature is fitted. Options for various trim levels include a voice-activated GPS navigation system with a 7-inch LCD display, a rearview camera for reversing, and real-time satellite traffic. A separate Power Moonroof Package integrates the rearview camera, and includes an auto-dimming rear-view mirror as well. 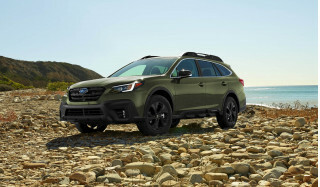 And active owners will also prize the huge selection of storage racks and containers designed to fit the Outback's roof-rail system, offered both by Subaru and many aftermarket specialists. The four-cylinder 2014 Subaru Outback with CVT gets decent EPA ratings; the six, on the other hand, is downright thirsty. You can get good fuel economy in the 2014 Subaru Outback, but you have to pick the 2.5-liter four-cylinder engine with the continuously variable transmission (CVT). That powertrain combines with the car's relatively light weight to make the base four-cylinder Outback the most fuel efficient model. 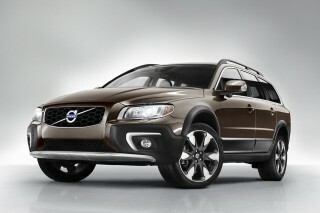 It's rated at 26 mpg combined (24 mpg city, 30 mpg highway), pretty good for an all-wheel-drive mid-size crossover. 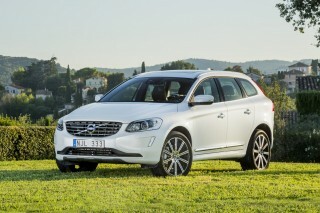 And we've found that Outbacks can outperform their ratings if they're driven in a relaxed fashion. The six-speed manual gearbox lowers those figures to 24 mpg combined (21 mpg city, 28 mpg highway). At the other end of the scale, the larger 3.6-liter six-cylinder engine (mated to a five-speed automatic) is rated only at 20 mpg (18 mpg city, 25 mpg highway), which is low against competitors with optional six-cylinder engines. Subaru is one of very few carmakers to offer a Partial Zero-Emission Vehicle (PZEV) package--for only a few hundred dollars on cars sold in states where it's not already required equipment--that reduces evaporative emissions and other pollutants. Exterior design/ wheel wells are too tight. Look wise and snow/weather wise. Comfortable & quiet with great traction. Enjoy the ride. Not SUV like. Interior is adequate & the car quickly responds to your commands. Gas mileage not as good as I expected. Otherwise very satisfied with auto. Great car! My forth Outback and the best of all. Does everything well. Handling Ok, for what it is. No comparison for the BMW's it replaced.